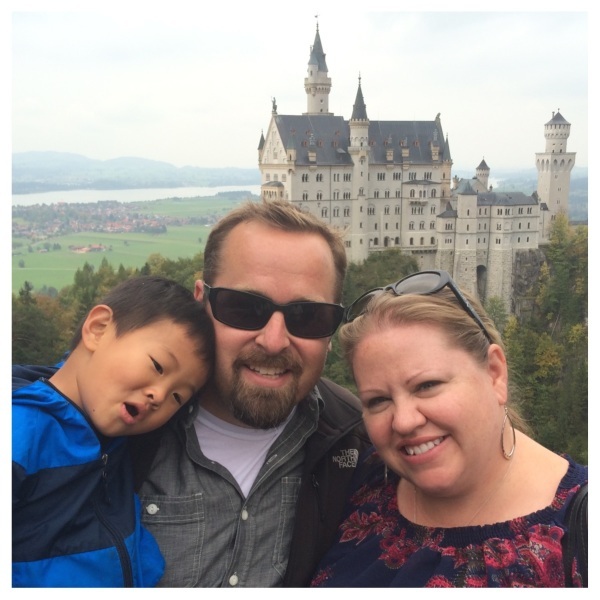 The last day of our Bavaria trip, we decided to see the Neuschwanstein Castle, located in Schwangau, Germany. We woke up in Salzburg, had breakfast, found our car, and made the 3-hour drive to Schwangau. When we arrived, it was overcast and there was a light drizzle. The parking lots at Schwangau are at the base of the hill, where the village starts. We parked and walked up to the restaurants and shopping area, and found the ticketing area. 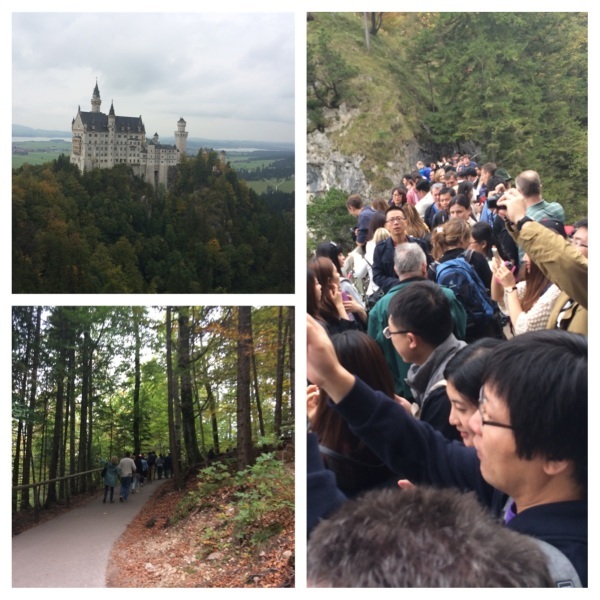 It was about 1:45pm and we discovered that the next English tour to Neuschwanstein wouldn’t start until 5. So, we decided to just take the bus up the hill and check it out on our own. But first, we wanted to have lunch. After lunch, we got in line for the bus and waited about 30 minutes for our turn. The bus takes you to the bridge that overlooks the valley, and has a breathtaking view of the castle. It really was amazing, and we got some good photos on the bridge. It is a little scary being suspended that high up on a bridge where there is standing room only with all the tourists! From the bridge, we walked to the castle, about 250m or so. At the castle, you can go through the courtyard to the gate, and up to the main receiving area. From there, you have an amazing view of the valley below, and can take some great photos of the inside of the castle courtyard. That’s as far as we went, as the guided tour usually takes you the rest of the way. So, we left the inside of the castle and checked out the gift shop. There, Ronda, Terri, and Brandi got some hot Glühwein, and Cooper, Mur and I got some water. We walked about 50m back down the hill to the horse carriage stop, and waited for the next horse carriage ride back down the mountain. The horse carriage wasn’t as amazing and others we have been on, as the driver really wanted to maximise his profits by packing in people on his carriage… We had 10 people on the carriage! We made it to the car and got back on the road. The trip home should have taken 3 hours, but we ran into a famous German staü which delayed us for 2 hours. Ugh. We finally made it home at around 8pm. 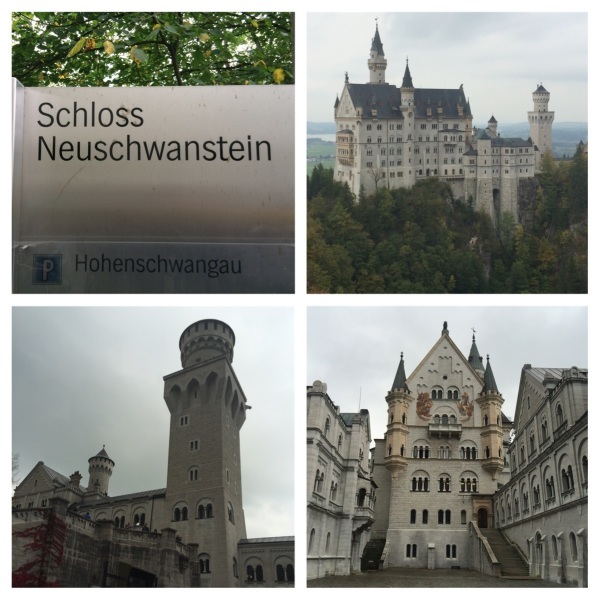 Check off Neuschwanstein - it was one thing we wanted to see and it really is beautiful. Recommend going there off tourist season to avoid the crowds!